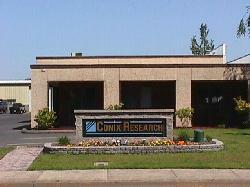 Conix Research Inc., About Us. If you would like to know more about our people, contact us and ask. We pride ourselves in being able to design and manufacture to our client's specifications, frequently making modifications to our standard line of products. Your demands on our products are our highest priority. If we don't already have something that fits those demands, we'd love to hear about your ideas for developing a new product or tailoring one of our existing products to suit your needs. Our engineers and technicians have years of experience in designing and manufacturing high quality automated equipment. They would love the opportunity to show off their skills. Established in 1990, Our first products were distributed exclusively under the private lable of the premier microscope manufacter of Japan. If you are involved in the microscope industry, you probably have seen our products under someone else's label. As we have branched out with other equipment manufactures, the quantity and quality of our products has continued to grow and improve. We are constantly striving to improve our products as well as identify and develop new ones to meet the current and future demands of our customers. We value your input to this process and would like to hear about any special requirements or technical problems that we could help solve. President and CEO, Vincent is a co-founder of Conix Research.